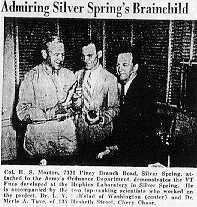 During World War II, many Montgomery County residents worked at Johns Hopkins University's Applied Physics Laboratory at 8621 Georgia Avenue in Silver Spring (now the site of a parking lot next to the Lee Building). Converted from a car dealership, the building was protected by an armed guard. Here the VT Proximity Fuze was developed. The VT Fuze was a vast improvement over contact and time fuzes widely used at the begining of World War II. In Navy tests VT fuzes were shown to be three times better at shooting down airplanes than the old fuzes. The fuzes were first used in combat to shoot down German V-1 rockets which attacked London in June 1944. By the forth week of use, almost 80% of the rockets were being destroyed due to the VT Fuze. Famed General George S. Patton wrote in a letter, "The new shell with the funny fuze is devastating...I think that when all armies get this shell we will have to devise some new method of warfare. I am glad that you all thought of it first. It is really a wonderful achievement." From The Maryland News, October 5, 1945.